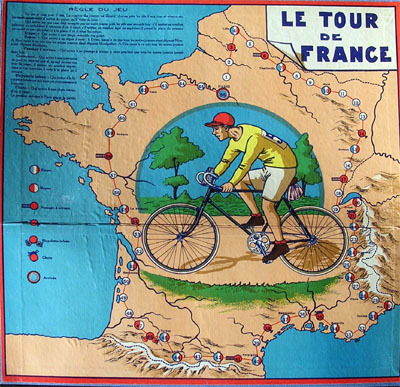 Classic Tour de France game. 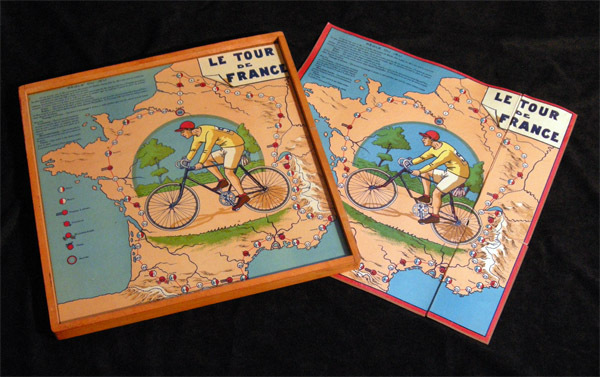 There have been different vesions of it, and according to Pierre Bertin ("De l'Arène Cyclista à la Grande Boucle", Vox Ludi), some versions of this game date from as late as the fifties or even sixties,. The wooden board featured below is probably even more recent than that. 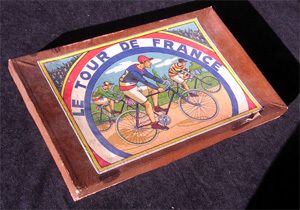 Apart from the wooden board, there are at least three different boxes. The two on the left belonged to the late Geert Lagrou's collection. The one on the right is a cheaper version of the game. 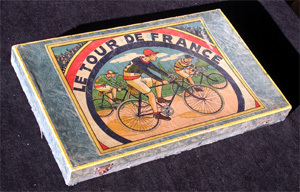 I read somewhere that this one was the oldest game be named after the Tour de France. I don't recall where I read it but I remember that it said the game was of 1930. 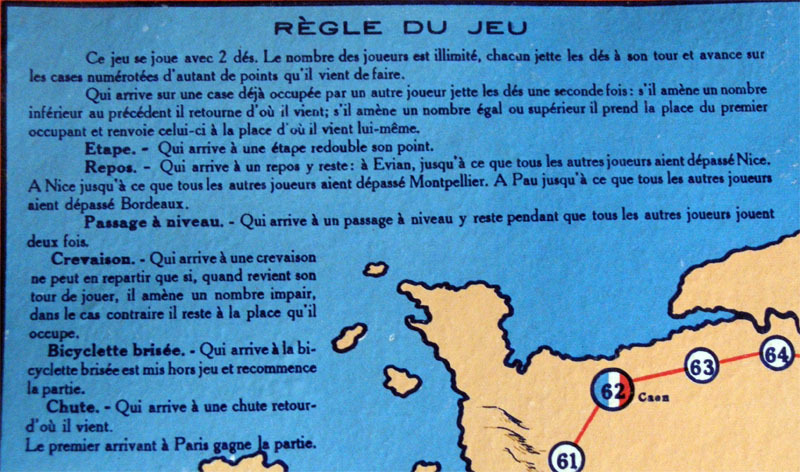 Of course, being the oldest game named after the Tour is a relevant fact (for collectors, at least) and one that would be enough, if true, to make this game an important one. 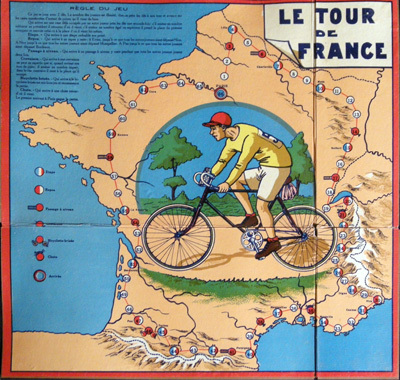 However, this game can hardly be from the year 1930 since, even if the retro look of the riders makes the game look older, it features the stages of the Tour de France of 1933. Still, as far as I was concerned, the claim of being the oldest game named after the Tour was undisputed until I discovered this other game. Now I see thins under a different light. 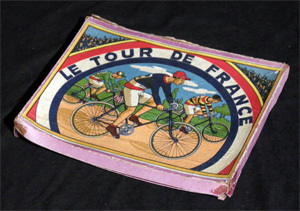 By the way, there are no maker's identification or date on any (known) version. 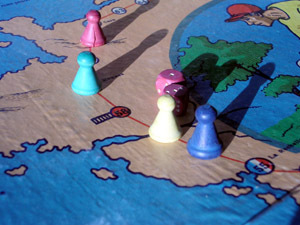 The board on the right belongs to the cheaper version. Since the box is smaller, the board is oddly bent in four parts. The cardboard is thinner, too. The rules are very simple. It is a game of goose, of course. The most interesting thing is that if you land ona a field occupied by another player, you throw your dice again, and if you throw less (than the number you have thrown to land on that field), you go back to where you came from. On the other hand, if your throw is equal or higher, it is the other player who goes back to the field where you came from.